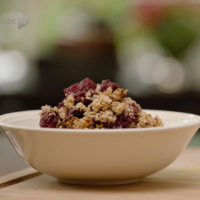 Crumble is one of my all-time favourite desserts – it’s just divine. Apples and blackberries are one of my best-loved combinations too, especially as they go the most perfect purple colour when baked! I love how the almond, oat and maple topping in this recipe soaks up all the fruity goodness when the crumble bakes, so that every bite is just oozing with juicy goodness. There are hardly any ingredients in this, so you can throw it together really easily and guess what, they’re all amazing for you! 1. Start by making the crumble layer. Place the almonds in a food processor and blend for a few minutes until a flour forms, then add this flour to a mixing bowl with the oats. 2. Place the coconut oil, maple syrup and cinnamon in a saucepan and gently heat until the coconut has melted, then mix together. Pour this over the oat and almond mixture and stir well until all the dry ingredients are coated with the wet ingredients. 3. To make the fruit layer, peel the apples and remove the cores, then cut into small pieces. Place these in a saucepan with the blackberries, maple syrup and cinnamon and enough boiling water to just cover the bottom of the pan, probably about a centimetre’s worth. 4. Place the lid on the pan and allow it to simmer for about 10 minutes, until the fruit is nice and soft. While this cooks, preheat the oven to 200°C, gas mark 6. 5. Once the fruit is soft, transfer it to a baking dish and sprinkle over the topping. Bake for 25-30 minutes, until the top is nicely browned. Serve and enjoy! This recipe was first published in Fri Aug 07 15:32:10 BST 2015.